CLC NSW produces a weekly email of upcoming learning and development opportunities for people working in the CLC sector. For more information contact CLC NSW 9212 7333. The following links are to different organisations which deliver training, face to face and by webinar, on legal topics for legal and community workers. Click on links to find out more. Ask LOIS is a secure website providing a free legal online information service (LOIS) for community workers in NSW, who are responding to women with legal needs. Ask LOIS is a project created and run by Women's Legal Service NSW. Ask LOIS provides community workers with free online training and advice on legal issues such as domestic violence, AVOs, family law, child protection, victims support and much more. It offers fortnightly webinars, a comprehensive resource library, case studies, videoconference appointments and a national DV service directory. Redfern Legal Centre works in partnership with community workers, by providing legal training and resources, so that you can better assist your clients. We train community workers all over NSW. We present a calendar of training webinars (online workshops) and face-to-face workshops - see below. Legal Aid NSW run free workshops, information seminars and online webinars about a range of legal issues for legal and community workers. 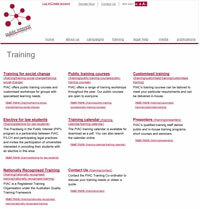 PIAC offers a range of set training courses including 'Training for Social Change' and 'Law for Non Lawyers'. PIAC can also customise training to suit particular requirements of the audience. PIAC is a Registered Training Organisation under the Australian Quality Training Framework. The Welfare Rights Centre, Sydney is a community legal centre specialising in social security and family assistance law. Legal Aid NSW offers training and self-development initiatives. These include face-to-face courses, online learning activities and annual conferences. Many Legal Aid NSW learning activities are open to private practitioners, community legal centres and Aboriginal Legal Services.